The hope of a peaceable resolution to the crisis rocking the leadership of the Peoples Democratic Party dimmed on Wednesday as the two factional leaders of the party renewed their hostilities. The fresh outbreak of hostilities is a major setback to the reconciliatory moves of the party, whose fortunes had plummeted after the general election loss of 2015. 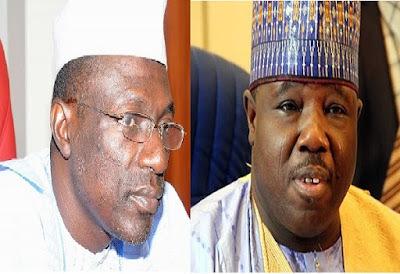 Specifically, the two claimants to the position of the national chairman of the embattled party, Senator Ahmed Makarfi and Senator Ali Modu Sheriff, accused each other of planning to subvert the party. The renewed battle for the control of the leadership of the party is coming barely 10 days to the Ondo State governorship election even as the party at the state level has been embroiled in a tussle for the governorship ticket. Makarfi, who is the chairman of the national caretaker committee of the party, described Sheriff as an agent of the All Progressives Congress. In a swift reaction, however, Sheriff, who is a former governor of Borno State, said Makarfi’s caretaker committee had been disbanded. He said the members of the committee could be disciplined if they refused to act in accordance with the party’s rules and regulations. Spokesperson for the Makarfi-led caretaker committee, Dayo Adeyeye, had queried the rationale behind a statement issued by the National Deputy Chairman of the Sheriff faction, Dr. Cairo Ojougboh. Adeyeye, a former minister of state for works, said it was obvious that the Sheriff faction was working for the APC. He said the faction was sending statements which he alleged were always full of lies to the members of the party nationwide. He said, “My attention was drawn to another set of lies contained in a statement issued by Dr. Cairo on behalf of his master, the former national chairman of our party, Senator Ali Modu Sheriff. “As much as we don’t intend to trade words with these former members of the PDP, we, however, feel constrained to put in the public domain, once again, facts as they relate to the intents of these agents of the APC masquerading as PDP members. Adeyeye said it was regrettable that instead of condemning the APC, the Sheriff faction was always criticising the PDP, especially in Ondo State where a governorship election had been fixed for November 26. “We can say without fear of contradiction and as well challenge Nigerians to point out where, even, for once, those parading themselves as PDP members, have dared to issue a statement condemning any of the several gaffes of the APC government. “We say clearly that not for once has Sheriff and his team of confused travellers said a word against the misgovernance of the APC. Sheriff, however, described Adeyeye as “a self-aggrandised spokesman”. In an interview with our correspondent, spokesperson for the Sheriff faction, Mr. Bernard Mikko, however, expressed the hope that peace would return to the beleaguered party soon. Mikko said, “The facts of the leadership crisis in the party are in the public domain, including the ongoing legal efforts that are being complemented with the political solution of reconciliation and rebuilding under the leadership of Sen. Ali Modu Sheriff, and supported by eminent Nigerians and strategic stakeholders who strongly believe that the PDP is not only a government in waiting, but also the only party with formidable structures and robust solutions to tackle the economic and social problems confronting our nation. Mikko asked members of the party to condemn the Makarfi group, which he accused of contributing “significantly to the affairs that led our dear party to a shameful defeat in the 2015 presidential election”. He added that the problem in the PDP “is neither the structure nor the ordinary people at the grass roots, but some terrible, vicious and greedy individuals who see the PDP as a franchise for criminal accumulation of our common heritage.